We’re incredibly grateful to all the people and organisations whose support allows this event to happen. To find out about all the different ways you can help support the festival, read on! We hold a quiz night each year to raise money for the festival. We would love to see as many of you as possible there for a fun night out that helps the festival to take place each year. Previous quiz nights have been held at the Royal British Legion building in Wythall. Details of this year’s quiz are not yet confirmed, but will be posted on our Facebook page once they are finalised. As the festival draws closer we often find we’re in need of odd things and places to store them. If you have a large garage which could provide a temporary home for a giant spider or if you’re a crafter who could provide fabric offcuts for the children’s activity tent, then we’d love to hear from you. Calls for assistance of this kind are usually posted our Facebook page or emailed to our list of volunteers. There are also sometimes get-togethers to help prepare items in advance for the festival and new faces are always welcome at these! A big part of our funding comes from the money left in the donation buckets by visitors to the festival each year. Thank you to all the people who donated in 2017 and please continue to give as much as you can spare at this year’s festival. It makes a real difference. 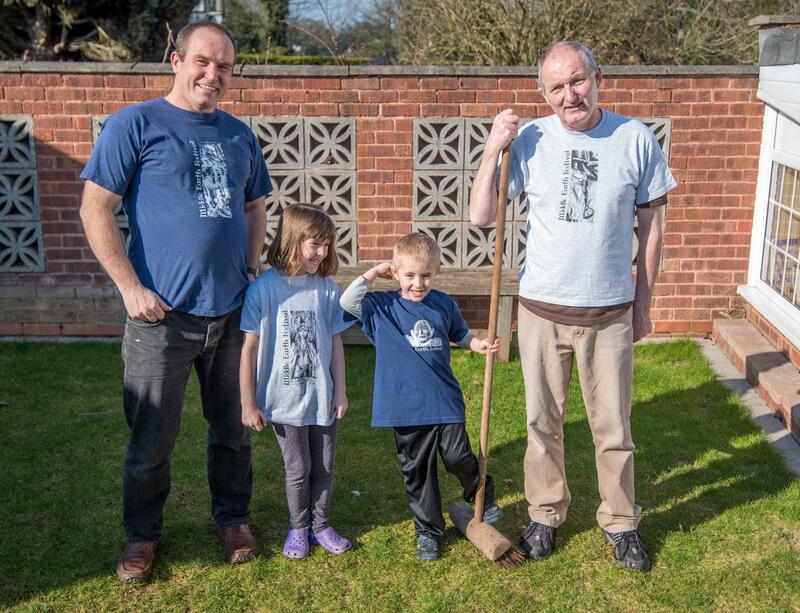 You can buy Middle Earth Festival t-shirts to help support us. T-shirts cost £10, plus £4.20 post and packaging. They are available in sizes from XS to XXL with designs featuring Bilbo, Galadriel, Gollum and Gandalf. Get in touch to place an order. Our stewards are the backbone of the festival. If you think you could spare a few hours over the festival weekend to help out, then please get in touch. There are tasks for introverts (setting out chairs, tidying up after activities) and extroverts (selling programmes, providing directions) alike. We are always particularly on the look-out for people with current DBS checks who can assist in the children’s activity tent and level-headed people to assist in the car park during busy periods, but people of all abilities and backgrounds are welcome. While stewarding is an unpaid position, our volunteer stewards do receive vouchers for free food and drink during the festival. We’d like to extend a big thank you to the generous suppliers who make that possible. Can you help us get the word out about the festival to a wider audience? Would you be willing to help distribute leaflets and posters or to share our messages on social media? We want news of our event to reach everybody.